Miracle Maker – waiting for a Christmas miracle! This Christian movie is perfect for people of all ages and a great option for a cozy movie night this Christmas season. 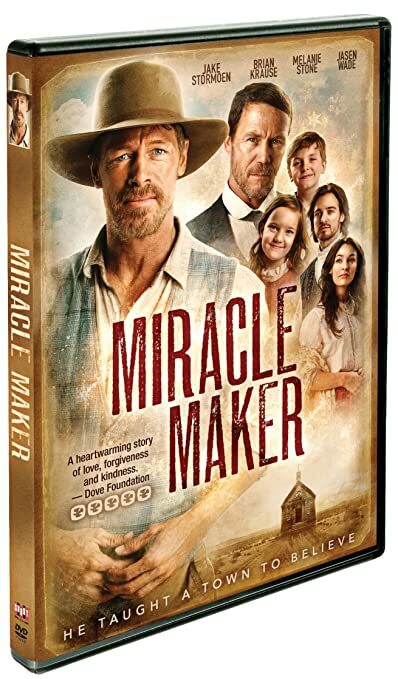 Miracle Maker has characteristics that make this Christmas movie a lovely addition to your movie collection as it contains an important lesson and message plus it has an uplifting story. Miracle Maker is about a small town called Woodhaven who is struggling to keep on going and it’s up to the Miracle Maker to fix what is not doing so well. But in the journey, the town starts to realize and learn that miracles from above arrive in different ways and don’t always occur the way they’d ideally like to. The small town of Woodhaven is located near the American frontier and now the town is struggling to get by. Beforehand the people of Woodhaven would normally go around full of hope and always ready to help one another. But now in the Christian movie, the residents are worried that living in the frontier is too much for them and that they won’t be able to manage. The main problem is that Mr. Booth is requiring the residents to pay their debts and the people are sadly unable to do just that at the moment. Christmas is just around the corner and the town that once was full of joy and filled with merriment whenever Christmas rolled around is now feeling overwhelmed by the magnitude of their struggles. There are not enough jobs for everyone in Miracle Maker and the locals don’t know if after this the town will continue to exist. Because of this the majority of the people from Woodhaven are short on cash and to make things even more difficult they have to pay whatever little money they have to mean Mr. Booth. This man is known for his riches and everyone owes him money. You can say that Mr. Booth is very similar to Ebenezer Scrooge from A Christmas Carol, getting large amounts of money and instead of helping others, he contains all of it for himself. His mind is set to have all the people that owe him to pay him and all that greed is certainly affecting the whole town and leaving them without much money left. The money issue is not the only problem but it’s causing relationships to strain and people are falling apart from each other instead of joining together more strongly during the difficult time. Even the majority of the relationships are choosing to give up. So the town we’re seeing in the Christian DVD Miracle Maker is in a horrible position right now. Even the fact that it’s almost Christmas doesn’t change their spirits. There aren’t any funds for luxurious gifts or tasty food. Apparently, there isn’t much push to celebrate Christmas. This makes a little boy take charge of the town he loves and decides that he wants to help out. Going out on a limb, the little boy makes a note requesting a Miracle Maker and attaches it to a bird hoping the note is found and someone is sent who can help them and fix what’s wrong. The young boy has so much hope that someone will come to help but the locals don’t take him seriously. But later on in this Christmas movie, a telegram arrives a few days later informing the town members that indeed, a Miracle Maker is headed to Woodhaven. Not knowing what a Miracle Maker looks like or what he/she does, causes the town to stir but everyone is looking forward to the arrival as they celebrate. Soon a man is seen headed to the small town of Woodhaven. As he’s getting closer and enters town, people’s high hopes are lost as they see a regular man, not someone special. The man dresses some raggedy clothing, doesn’t have much money and owns a chicken and a dog. The people immediately doubt that this man is the Miracle Maker and they look to their local pastor for reassurance. The pastor takes the time to teach the town members a lesson about how miracles can come in different ways and with a different appearance than what they expected. Soon something big was to occur, something they’d never imagined. Want to know what happens with the town of Woodhaven and its Miracle Maker, make sure to obtain this Christmas Movie at the Fishflix store!